*All model numbers are based on the Studio 49 catalog. Melodic percussion instruments are an expensive investment. Here are a few ideas to consider before you lay out a plan. Always strive for durability over price. With the best quality instruments, the parents can plan on this investment lasting for many years to come. An instrument that can’t hold up for at least ten years in children’s hands is a waste of money. Climate control to select a material. If you can’t guarantee the instruments won’t get baked during the summer, choose fiberglass composite bars over rosewood. The bars won’t go out of tune and they won’t chip if dropped. Room size/storage space for design. Choose shorter, stacking xylophones if your storage space is an issue or if you may have to travel on a cart. Largest class size determines the total inventory. You’ll want an instrument for at least half the largest class. Partner work allows the children to help each other. The highest grade level for your scope and sequence defines what you’ll need. 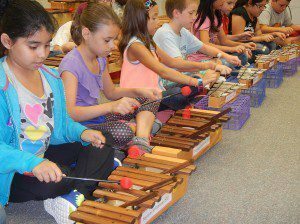 Melodic percussion is the key to developing a child’s musical foundation. So, having a melodic instrument is more important than chromatic instruments or bass bars. They are fun to play, but aren’t the best use of your limited budget. You can add these later. Barred: 3 SG, 3 AG, 4 SX, 4 AX, 1AM, 1 BX, 1 BM. Basic Un-pitched: 30 pr. rhythm sticks, 30 nested hand drums, 5 triangles, 5 wood blocks, 2 guiros, 2 mini cabasas, 5 tambourines, 2 pr. maracas, 1 temple block set, 1 suspended cymbal, 1 wind chimes, 1 gong, 6 tunable tubanos. Once you have this basic set, make another five-year plan depending on your scope and sequence for your eldest grade level. If you have upper elementary or middle school children you might consider adding chromatic instruments or bass bars for functional harmony accompaniments. The sequence for bass bars depends on whether you have a recorder program. The lowest three pitches cost much more. I recommend purchasing F and G first to cover songs in more keys. Then add a few each year. Parents and administrators may be more supportive when they see a long-range plan. Good luck! This is exactly what I needed, exactly at the time I needed it in transitioning to a new school that isn’t as well outfitted as the one I’m coming from. Great post, thanks! I came inherited a program this year with several Orff instruments, some totally fine, some in desperate need of TLC. As I’m trying to figure out what should be saved, tossed, repaired, etc, I would love to know what the *ideal* number of instruments and what type of instruments a classroom should have. Would you consider your sample inventory list the bare minimum/the ideal set up? Would you tweak it at all? For the sake of computing, I teach K-5, max 30 per class. I have a SM, AM (in need of some TLC), a BM, SX, AX, BX (in need of major TLC), and a small mountain of the old Rhythm Band 20 Key Tone Bells. I do have most of the non-pitched instruments that you mentioned. Just trying to figure out where to go next with the barred instruments! Sorry if that’s a lot of info and too specific! Any help would be appreciated! The bare minimum would be 15 melodic instruments so children can work in pairs to help each other create melodies and learn accompaniment parts. The woods are easier for children to hear their own work without the ringing of the metals. If you have the storage and work space, an instrument for each child would be amazing, but really loud. You’ll have to make a thoughtful choice. You can find replacement parts at both Music is Elementary and West Music. The website has detailed instructional videos by Dr. Lissa. You have a good start on inventory with the six. Gradually replace the tone bells when you can. Depending on your resources, I would go for woods first. Would you suggest tubanos that sit on the floor or tubanos with plastic “feet”? What size? I would only purchase the tunable tubanos with integrated feet. Choose high-quality instruments that will last your career and beyond. Thank you for this helpful article! Question: When you talk about “nested hand drums”, are you referring to frame drums or hand drums that can also free stand? Frame drums such as the Remo or Basic Beat brands that come as a set of four or five ranging from 8″-16″. You can even order a zippered carry bag with shoulder strap. I don’t recommend the 22″ hand drums. They’re too large for children and are the first to loose their tension. If you have some hand drums that have lost their grip, try placing in a 350 degree oven for only 20 seconds. This should shrink the plastic to save the drum. Be careful to not overcook! The surface will shrink too much and crackle. If this happens, sand the bumps lightly with 150-200 grit sandpaper. Boom!